HORSHAM, Pa. – Cottman Transmission and Total Auto Care continues to bring home industry honors with a new award that emphasizes the impact the Transmission Physician has made in the auto industry, growing the brand’s reputation for service and quality. Cottman’s web series the “Transmission Physician Educational Video Series,” featuring an animated female transmission expert, earned the Silver Award—an honor bestowed to outstanding entries of creative excellence on the web. In determining winners, entries are judged based on a standard of excellence as determined by the AIVA, according to the category entered. To uphold a high standard of excellence, a category may have multiple winners, or may have no winners at all, and are scored on a 100-point scale by judges. 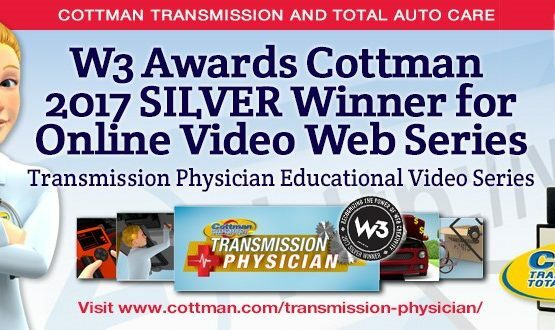 Winning a W3 Award continues to raise Cottman’s reputation as an industry leader, and for the Transmission Physician video series as they contribute to the overall marketing strategy of Cottman. The Transmission Physician web series is a standout component of Cottman’s broader catalogue of educational digital content. Using accessible animation and themes, Cottman shares its educational videos on the brand’s website as a way for consumers to learn more about common car care topics. The W3 Awards is sanctioned and judged by the Academy of Interactive and Visual Arts, an invitation-only body consisting of top-tier professionals from a Who’s Who” of acclaimed media, advertising and marketing firms. Please visit www.aiva.org for a full member list and additional information.